What could be better than driving your brand new remote control Porsche 911 Cabriolet convertible RC car around your neighborhood and speeds of up to 10 mph? It took us a while to figure out as well, but then we found this version of the Porsche 911 car with tires that also has lights and can drive around at night to. This is a high grade vehicle with an amazing white paint job. This remote control Porsche Carrera comes with a full function toggle remote control and measures a huge 14.5 inches long making it the perfect size for outside and inside. 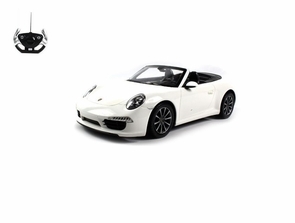 This is a fantastic deal on a scale high quality RC Porsche 911. Wow the car is better than described. Has headlights tail lights and wheel rim lights. Works great I love it! Also fast delivery.